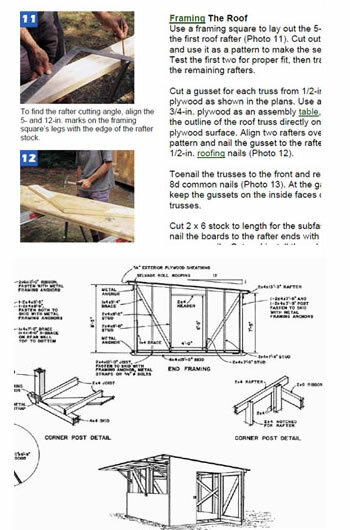 Planning To Build A Shed? Now You Can Build ANY Shed In A Weekend Even If You've Zero Woodworking Experience! 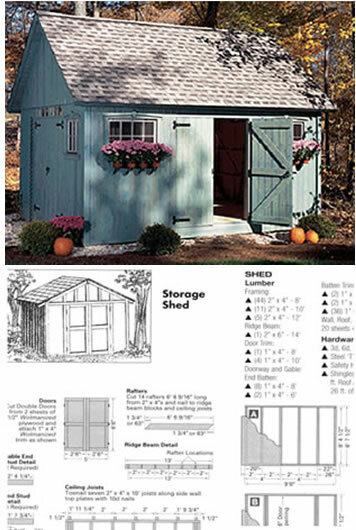 Start building amazing sheds the easier way with a collection of 12,000 shed plans! One time payment. No hidden charges. Want To Build Sheds Like These? Select from our library of thousands of styles and designs! Our plans include complete step-by-step details. If you are a first time builder trying to figure out how to build a shed, you’re in the right place! Our plans are designed to be easy to follow by anyone, in other words no blueprint reading experience necessary. You can materials list for every project so you’ll know exactly what you need to start building. Woodworking publishers HATE what I'm about to reveal. ...I'm about to reveal some EMBARRASSING secrets woodworking publishers don't want YOU to know. I've been exactly where you are. I bought a shed plan... started to follow it... got the 2x4's, the tools, and even started cutting to size.
" How Do You Get From This Point In The Plan To This Part?! " If you've worked on any kind of project, you get exactly what I'm talking about. Most shed blueprints don't work. They are either too complicated or too dumbed down. With incomplete or just plain wrong instructions, they’ll have you tearing your hair out by the end of it. AREN'T EVEN WRITTEN BY WOODWORKERS! " 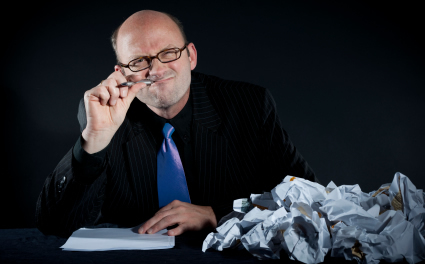 They're written by ghostwriters who've never touched a piece of lumber or a chisel in their LIFE! They could NEVER tell if a step didn't make sense or not.
" ...You'll NEVER need to Worry About Cutting the Wrong Size, Spin In Circles or Waste Time Trying To Figure Out What Goes Where... "
And let's not even get into trying to "Wing it". You and I are well aware how that'll end up. Well, hang tight. I've gotcha covered. See EXACTLY how everything should look BEFORE you build them. You end up building a part of your shed that LOOKS like the drawing... but it ISN'T. But you missed it because the plan didn't show you each angle! And the only way you find out, is at the end when you've wasted all that time, money and sweat... and nothing fits together. Detailed instructions should be so simple that a kid could do it. So detailed that you know exactly what you're doing every step of the way. No complicated instructions that will have you scratching your head or confusing technical jargon. Many other plans assume you're experienced enough to tell what the next step is. When instructions are THIS clear, your shed BUILDS ITSELF. All the pieces just “Click” into place. When the steps are “LEGO clear”, building PERFECT shed is more like putting a bunch of Lego Blocks together. No. Wait. Not Lego... more like DUPLO blocks! Complete “materials and cutting lists” that actually makes sense! When I say complete, I mean COMPLETE. Your shed is only as good as the materials you use to buy them. It allows you to buy exact amounts. And also what you don't need to buy right now. It saves time and cuts down waste. It saves money. Because you only buy EXACTLY what you need... and WHEN you need it. Don't give you EXACT measurements to cut your lumber. 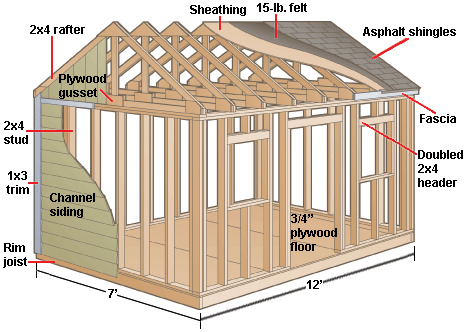 A PERFECT shed plan will NEVER leave you guessing or scratching your head. Other plans show you only 1-sided views. That is not enough. You'll still be wondering if you put a wondering if you put a “joint” or a “frame” together the right way because you didn't view it in 3D. CAD designed drawings show you EXACT proportions. It's unbelievable, but so many plans show completely WRONG dimensions. Or even HAND-Drawn plans that are a joke. Which of the two would you rather use? Your materials list should show what each item is USED FOR. Just because a PILE of 2x4's are scattered across your backyard, doesn't mean you're going to use all of them right way. Some will sit around, occupying valuable space, all the way until the last step. I know because I've taught tons of people to build stunning , inspiring and professional looking sheds, that that leave you in AWE. ...And they created the perfect shed THE VERY FIRST TIME. So, I know it's not a fluke. ...a living, breathing woodworker whose taught dozens of first-time-woodworkers to build STUNNING, master-level shed's time and time again. 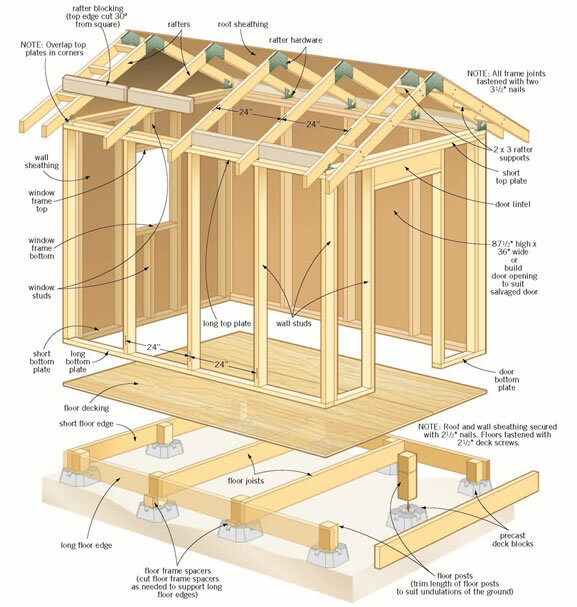 Each plan contains all the components of the “perfect shed plan” that I showed you above. This includes cutting lists & tools, with clear labels showing what they each item is used for. (So you can buy JUST what you need, budget better and multiply your floor space). You Will Find -- ANYWHERE! You won’t hit a wall, feeling lost with what to do next. The plan will hold your hand from step 1 and guide you along each step. All the planning done for you… so you never have to worry when you start building your first shed. You won’t be guessing whether you’ve got it right not. You’ll have complete confidence each step of the way, that your shed will come together perfectly. You get thousands of designs and styles of sheds! Do it for FAR less and FAR faster! "You could spend hundreds of thousands to build your shed... but why, when Ryan shows you how to do it for far, FAR less..and FAR faster!" "Hey Ryan, just wanna let you know that your materials some of the best that I've ever seen. One of your bonuses really sold me and it was the guide to woodworking techniques. Thanks again for your wonderful work and most of all for sharing your work in such a generous way." "I've been a builder for many years and have seen quite a fair bit of sheds. 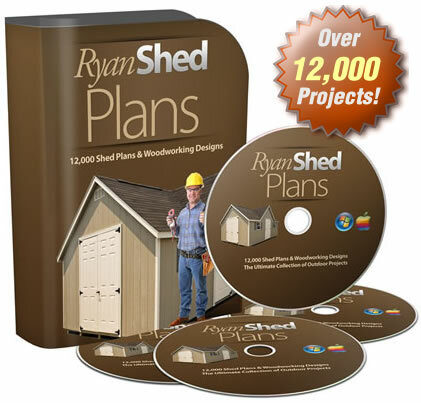 The plans in Ryan's package has some of the nicest looking sheds I've seen in a while." Don't crawl...Run to get this now! "If you love woodworking, don't crawl. Run to get this now! Over the years, I've bought many books and plans. This is, hands down the best and the most bang for buck of all of them." Designs on all your sheds are exceptional! "Ryan, just dropping a note to let you know how stoked I am with your package. I've been looking for something like this for a while. The quality of the designs on all your sheds are simply exceptional! Loved all the photos and systematic step by step approach." 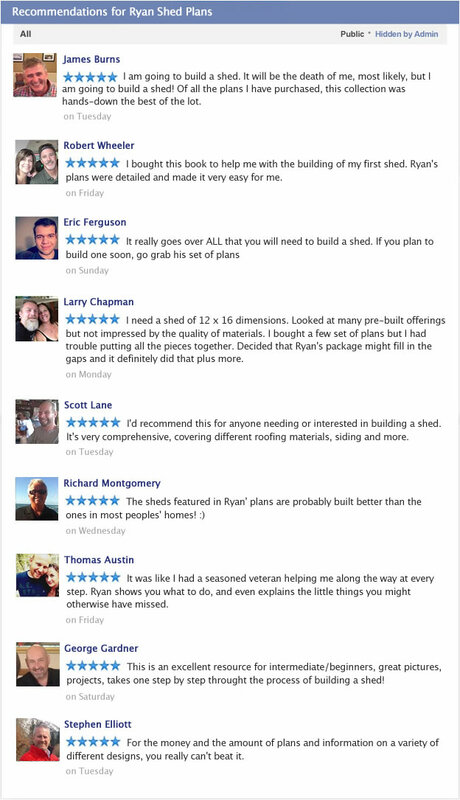 "I've used Ryans shed plans to build a 8x10 outdoor shed for my kids. Clear directions and materials list assisted me, a non-builder, in completing the shed I wanted. Its great for a novice builder like myself!" Details are easy and straight forward! Great stuff there Ryan! Plans and construction details are easy and straight forward. The designs are really nice yet practical. Thank you! Turned out nice looking and sturdy! "Ryan, just wanted to you know that I've completed my outdoor shed and it turned out nice looking and sturdy. Not to toot my horn but it is way better than the sheds that many of my neighbors had put up." You see, I’ve helped over 4,000+ woodworkers, create and build sheds the easier way. 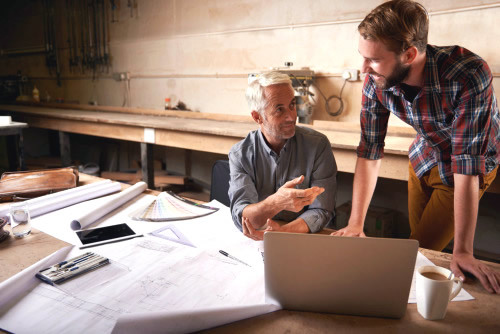 By using all the plans and blueprints — I have helped home owners and establishments alike construct remarkable looking sheds and woodworking projects at the fraction of the cost they would normally pay! 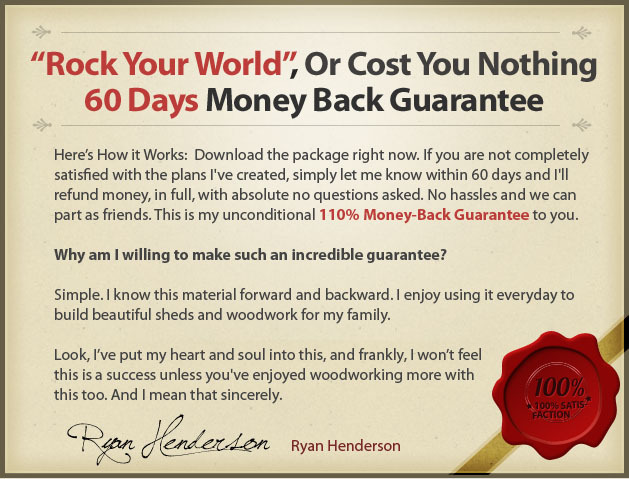 You have 60 full days to try Ryan's Shed Plans ON ME - risk-free. Either you're overwhelmed by the positive results or you pay nothing. If you don't find our service and attention to your satisfaction top-notch... OR even if you don't like the FONT I use in the book... it doesn't matter... I'll refund your money. All you need to do is email me, and I will cheerfully give you 100% of your money back. No questions asked, no hassles, and no hard feelings. Plus... if you get it right now, I'll throw in these 4 special bonuses for you. ...I collected some techniques that were even more advanced than anything you'll find in before. ...that suddenly enabled me to create jaw-dropping projects more consistently in the last two years than I've ever experienced in the prior 10 years! 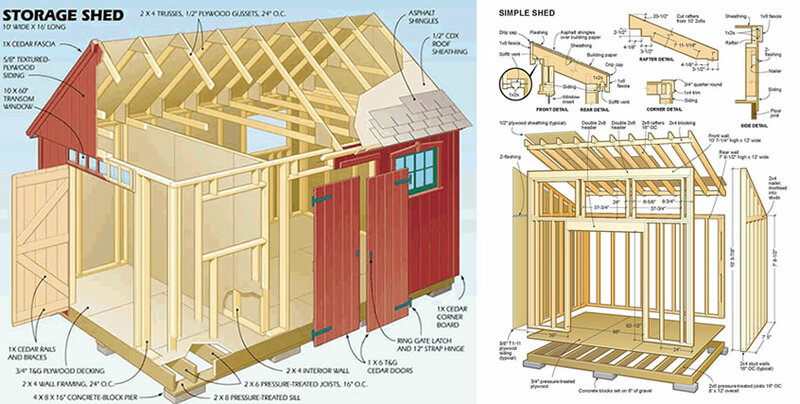 This worksheet will show you how to modify the dimensions of ANY of the sheds you choose. Make your shed fit ANY area or space you want. There is NO guesswork at all. 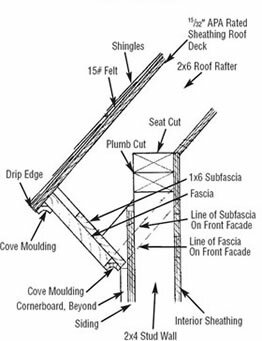 Use my worksheet and you'll get the precise cuts and lengths you need to modify your shed exactly the way you want it. Find ANY woodworking supply, equipment or tool anywhere, anytime. 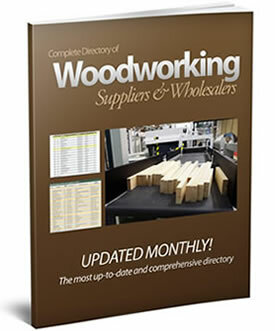 This directory is the latest, most up-to-date and comprehensive directory of suppliers and wholesalers to date. Even those hard to find, rare exotic woods, will be within reach. See what exists in your town or have it mailed to you. You can do it with this directory. Your woodworking efforts will be a thoroughly satisfying, enjoyable and ego-boosting experience! You will no longer dread the next time you sit in front of your shed plan. Your buddies will watch in awe as you put up your shed with the precision of a veteran woodworker. Speaking from experience, I hope you can handle a lot of other woodworkers' envy — because you're going to get your fair share of it. ...and a lot of people begging you to tell them your secret ! You, of course, won't mind this a bit. Your account balance will start overflowing like a dike in a storm. You'll be getting offers to build sheds for your friends and colleagues. And your biggest concern will figuring out how much to charge for your “expert” advice. As It's Supposed To Be! ...and with higher accuracy because of the incredibly clear and complete instructions that give you a clear view of every step you need to take -- before you take it. Look, building a shed shouldn't be this hard. You'll discover how to build a beautiful, professional looking shed in as little time as weekend without having to take out a second loan! You may have some experience with woodwork. You may think you can roll the dice and get it done on your own. More power to you. Go for it. You may not mind having to go back to Home Depot 2 or 3 times. Then hunt down one of the employees (which takes about 10 - 20 minutes) and hopefully they can fill in the holes in the plan you're using. And maybe -- just MAYBE -- you'd get the shed complete. And if you're LUCKY... you won't have those aggravating misalignments that stand out like eye-sores. It's fine if you want to do this. Most people do. Then again, most people give up. And spent about 3 to 4 TIMES what they should. Avoid, wondering if you are doing it right. Be able to see what it's supposed to look like from all angles on paper, so you KNOW you got it right at each stage. And at the last step, when everything comes together, they come together PERFECTLY. Every edge, every joint, every part fitting PERFECTLY. And VIOLA! You have a stunning, perfect, shed that looks like a professional woodworker made it. And best of all, you saved money ... saved time ... had fun ... and avoided a load of stress. Go ahead and try my shed plans package for your self completely RISK FREE. 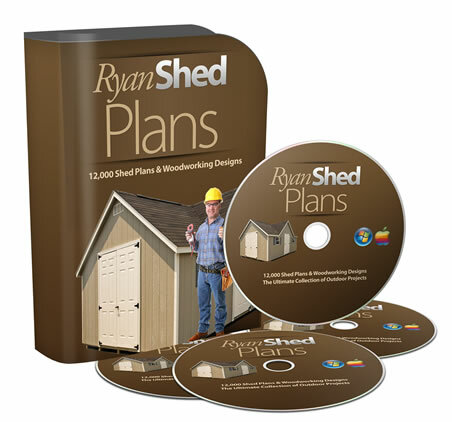 In addition to how much you'll love “Ryan's Shed Plans”, you'll also like the fact that it's affordable. You see, I'm giving a SPECIAL DISCOUNT PRICE to woodworkers like you who are on this page right now. For everyone else, when I decide to raise the price, these plans will cost $297. But if you order today at the introductory , the price is only $37 . That's an INSTANT $260 savings just for ordering right now. Plus, you also get all 4 special bonuses I described a moment ago — a $340 value, absolutely FREE. And, you're fully protected by my guarantee. You get instant access to over 12,000 shed plans and designs covering all types and sizes – from large out buildings to compact storage sheds and everything in between! Get LEGO style assembly instructions, 3D CAD images, cutting lists, list of materials, views from all angles and all details for each shed plan. Get $340 worth of time-limited bonuses if you order today. 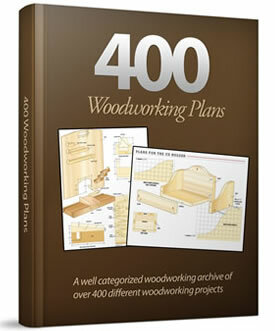 Bonuses include: “Advanced Woodworking Tips” book, “Magic Modifications”, directory of suppliers and 400 woodworking plans. You get a special introductory price if you order today backed by an ironclad 100% money-back guarantee. P.S. 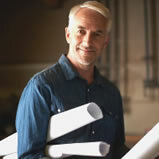 My plans covers every single thing you need to build an impressive new shed that will get the awe and respect of the most seasoned woodworker. But you have to see them to appreciate what I've put together for you. P.P.S. And since you take NO RISK because of 60 Day, 100% Money-Back Guarantee, you'd be foolish to pass up this opportunity! Click here to order now and you'll get INSTANT access to the download page. Couldn't be happier with the results! "Bought the plans and my son and I built the shed on his property. Couldn't be happier with the results. Great product...full of precise dimensions and ideas for us. Thank you! 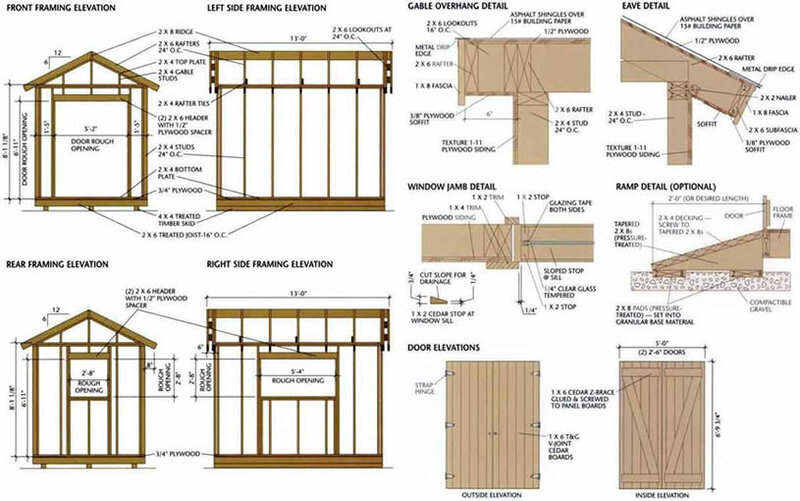 "This collection of shed plans is the best investment I've made in a long time. 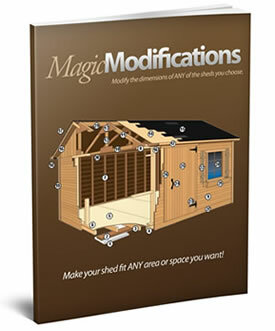 It contains all you need to start on any shed.. materials lists, estimated costs, step by step details. 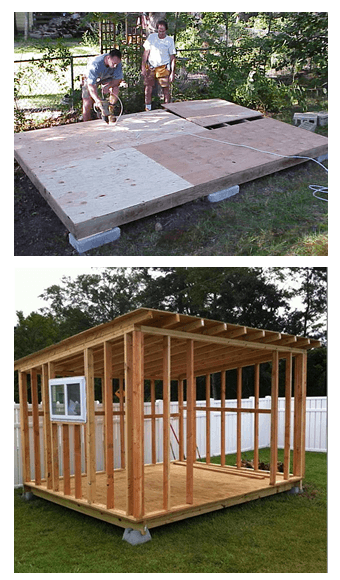 It gave me the tools to build a truly awesome garden shed for my family"
How much does materials cost to build the sheds? The cost of the shed depends on the size and the quality of materials you choose. For a 10×8 shed, it would cost about $900 vs buying a prebuilt shed that would cost more than $3000. 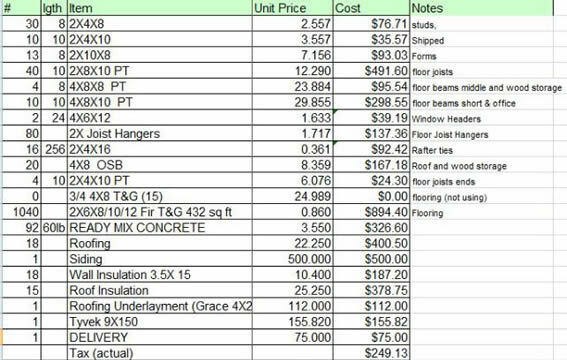 For a 12×20 shed, it would cost $1000-$1500 vs a prebuilt shed that costs close to $5000. Can I build this shed on my own? Absolutely! We designed our sheds for DIY beginners with instructions so detailed that anyone can get started building their first shed. How long does it take to build my shed? 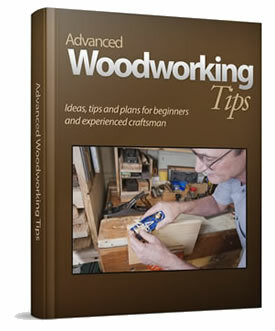 It usually takes 1 day for experienced woodworkers and 3-5 days for complete beginners. How professional are the plans? All plans are designed and drafted by me with the help of several professional craftsmen and certified architects. Can I download a free sample of the plans?